One of the biggest blunders many clients make when procuring web design and development services is underestimating the ongoing commitment that their website or web application will require from a maintenance perspective. Much like any other virtual or physical property, a website is a living, breathing ecosystem that requires upkeep and advancement. However, many companies pretty much disregard what the ongoing needs of their project will be. Some costs are difficult to predict in advance, of course, but it is always possible to predict some of the reasons why there would be additional costs down the road. To be fair, this isn’t all due to ignorance on the client side. A good development agency should help a prospect or potential client during the business development cycle to gain an understanding of what these requirements and possible scenarios might be. Unfortunately, there are many agencies that simply don’t want to deal with maintenance. The big bucks for these agencies are in churning out project after project and then leaving the client to fend for themselves when it comes to ongoing support. These reasons are why this topic is often overlooked, and why clients are forced into finding new developers to help them maintain work that oftentimes was created by another agency. The purpose of this post is to help you understand what scenarios most often result in maintenance tasks. Hopefully, in the future when procuring web design or development services, you can utilize this list as a resource for acquiring the right partner—not just for your initial project, but for your ongoing needs as well. Software updates are going to be an issue for pretty much every project you ever engage in. They happen at the server level with operating systems and kernel updates, down to software on the server such as Apache, MySQL, and PHP. They can also be a major factor with off-the-shelf platforms such as CMSs and e-commerce systems. These updates can be minor patches, which plug small security holes or fix bugs, or significant upgrades. The issue with updates are twofold. First, they are completely unpredictable. You have almost no way of knowing when updates will come down the line for the software you use. This issue is much more of a concern for off-the-shelf platforms as opposed to server software. Server software updates are slower to be released and are not always such an urgent need that you have to stop traffic to proceed with the update. However, with off-the-shelf platforms, you oftentimes have a much higher level of urgency as the unplanned updates are usually targeted at security flaws or performance issues. Therefore, these updates cannot be overlooked. That unpredictability makes budgeting difficult. It also means that you must find a partner capable of facilitating those updates quickly. A delay could mean a liability for your business. The second issue with software updates is that they can often break other pieces of your ecosystem that have cross-dependencies. A good example of this is when an update to your CMS breaks either a custom or off-the-shelf plugin. Now you have a situation where a seemingly benign adjustment results in another problem. And if you aren’t lucky, it could trickle down into additional issues as well. Much like trying to time when updates are released, predicting where a cross-dependency issue will arise is challenging. The best preparation is to have a service-level agreement with your agency that will ensure a response time that will work for your business. Thankfully, software and technology advancements move at a slower pace than the aforementioned updates. But software does advance and new technologies do present themselves, and it is important you are prepared for the possibility that you’ll want to shift technologies in the future, try new tools, or implement new approaches to previously solved problems. Granted, any example I could present would be a complete hypothetical, but this is an unknown that you should budget and plan for, even at a budget that is a small percentage of the original project budget. Conceptually, this is great. And every company should have an ongoing campaign of improvement. Unfortunately, almost no one budgets for this. Too many companies still believe that when a website is done, they can let it sit and then visit it again in 2 years when the redesign cycle starts anew. Don’t fall into this trap. Make sure your budget and planning includes line items for continuous improvements to your website or application down the line. If you are running an application-based or SaaS business, this is unavoidable. User feedback will lead to constant changes and enhancements to your product. And as a marketer for a B2B or B2C business with an informational website, modern analytics will give you insights that will need your attention. Planning ahead with monthly or quarterly improvement budgets should be part of your process of procuring the services required to complete your project from the conception, not the completion of the original service contract. I’m going to separate this into its own item, even though to the casual reader this issue seems very similar to the above section on updates. The reason is because platforms come in and out of support by their manufacturers or open-source providers, and this is something you must account for in the future. An example of this is a CMS platform such as Drupal. As Drupal 8 became the new released version, Drupal 6 started to lose its support from the community until it was dropped all together. This type of transition won’t happen often, but it is important when determining what platform you will utilize to get a sense of where you are in the cycle of development, as this is a bit more predictable. Developing your site on Drupal 7 today with Drupal 8 being available would be a completely avoidable mistake, and something you can prevent with just a little bit of research. There are two ways to host your website these days. You could go to a shared hosting provider, where you simply have space on their servers, typically shared with other customers. The pros of this scenario are that they oversee the server software, updates, security, etc. The cons are that sharing server space can lead to outages if other accounts on the server run into trouble. Today, most clients that hire agencies are interested in hosting via cloud-based services such as Amazon or Rackspace. Granted, these are the best providers out there, so I wouldn’t worry much about those choices. But the most utilized products that people request are the virtualized servers. These are basically stand-alone servers that are using slices of infrastructure. Much like a physical, co-located server, you can log in and access the operating system, install software, and pretty much do anything a physical box can do (except, I guess, access the serial port!). The negative to these new hosting products is that they are what they sound like: servers. This means they need a variety of upkeep to run well. First, they need constant updates and upgrades. As I detailed above, server software can have security flaws and bugs that need to be addressed. Secondly, these servers need to be monitored for downtime. The hosting providers don’t do that as a standard offering. Finally, backups should be considered as something worth doing. A good analogy would be flying an airplane on autopilot versus manually controlling it. You’ll have more control flying manually, but you’ll also have to put a lot more attention into the proceedings. 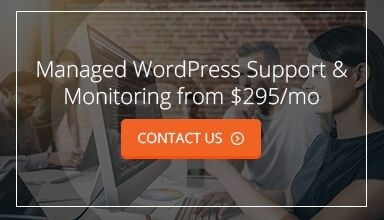 Tying this back to the point of this post, clients must plan ahead for how they will manage their hosting infrastructure and include those costs when budgeting. As an aside, there are third-party services that provide these server maintenance services, as do some hosts. Many agencies also provide this coverage, so ask ahead of time to establish costs. This last point is typically the one no one ever thinks about. Predicting future legal requirements is difficult, if not impossible. But this is something that is important to consider as a future maintenance issue. The best way to explain this point is to bring up an example that is causing many business owners much frustration lately. The largest marriage between legal requirements and technology today is ADA compliance. We’ve written a few blog posts about ADA compliance in terms of website design and app development. Basically, having a website and a brick-and-mortar store at the same time may subject your online storefront to the same stringent set of ADA standards as your physical location. ADA compliance online is accomplished via a series of coding techniques that allow for greater visibility and usability for disabled site visitors who utilize various devices for browsing the internet. Compliance is not well documented and confusing, but the courts have upheld complaints regarding this issue, causing business owners to scramble to be compliant. Given the current landscape regarding privacy, security, and accessibility, it is important to make sure you have a team in place that will respond quickly to issues as they arrive. Receiving a demand letter from a law firm without anyone to help is not a scenario you want to experience. As we wrap things up, I do want to make one point. It is always more expensive to have one agency develop your project and then shift to another group for maintenance. The simple reason is that every agency works differently, and onboarding existing projects to a new group is a cost that you, the customer, will be forced to bear. When deciding what agency is best for your project, make sure to consider their capabilities to support you in a timely fashion in the future and what systematic approach they have for the maintenance issue. From there, you can discuss what maintenance arrangements are available and have a clear understanding of your upfront costs, as well as costs you may encounter down the line.